President Lyndon B. Johnson held a White House Rose Garden ceremony on September 3, 1964, signing into law the Wilderness Act. The Wilderness Act created the system that legally preserves our wildest lands from development of any kind. Various kinds of “wilderness” areas had been created during the first half of the 20th Century, but they were a random assortment of lands embedded in the administrative structures of other federal land management agencies. The Wilderness Society, led by its long-time Executive Director, Howard Zahniser, thought that something more organized and permanent was needed. Zahniser said, “Let us be done with a wilderness preservation program made up of a sequence of overlapping emergencies, threats, and defense campaigns.” Instead, in 1956, Zahniser drafted a bill that would define, designate and protect wilderness areas in a formal and systematic way. 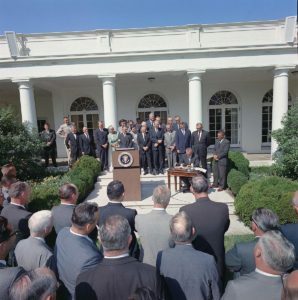 President Lyndon Johnson signs the Wilderness Act in the White House Rose Garden, September 3, 1964. (The other conservation bill signed by President Johnson that day was the Land and Water Conservation Fund bill). The Wilderness Act accomplished several things. 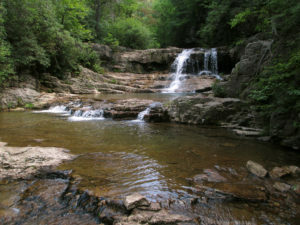 First, it defined wilderness as “…an area where the earth and its community of life are untrammeled by man, where man himself is a visitor who does not remain.” The definition included details about the kinds of lands that can be designated as wilderness (size, level of previous modification and others). Second, it created the National Wilderness Preservation System to coordinate the oversight of wilderness areas that lie within the four main land management agencies of the U.S. government. Third, it immediately placed 9.1 million acres into “wilderness” designation and ordered the study of many more areas to be included. Today, the United States has about 110 million acres of designated federal wilderness, distributed over 700 individual sites. Most wilderness lies within the National Park Service (44 million acres), followed by the Forest Service (36 million acres), the Fish and Wildlife Service (21 million acres) and the Bureau of Land Management (9 million acres). All but six states have some land in designated wilderness areas. President Obama signed a law in 2009 that added 2 million acres to the wilderness system, but no further additions have occurred since then. Geiling, Natasha. How the Wilderness Act Was Passed. Smithsonian.com. Available at: https://wilderness.smithsonian.com/history/. Accessed September 1, 2017. Johnson, Lyndon B. 1964. Remarks Upon Signing the Wilderness Bill and the Land and Water Conservation Fund Bill.” September 3, 1964. Available at: http://www.presidency.ucsb.edu/ws/?pid=26481. Accessed September 1, 2017. The Wilderness Society. Wilderness Act. Available at: http://wilderness.org/article/wilderness-act. Accessed September 1, 2017. Wilderness Connect. The Wilderness Act of 1964. Available at: http://www.wilderness.net/nwps/legisact. Accessed September 1, 2017. Wilderness Watch. The National Wilderness Preservation System. Available at: https://wildernesswatch.org/the-national-wilderness-preservation-system. Accessed September 1, 2017.